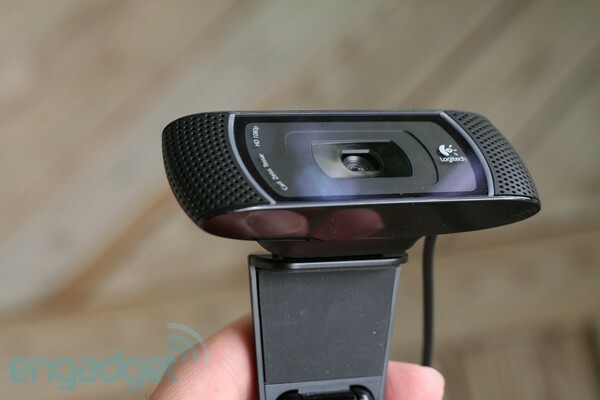 As we mused when we recently got a chance to try out the Logitech HD Pro Webcam C910, it wasn’t long ago that VGA was good enough for online chatting. No more, and with the release of SkypeHD going high-def is easier than ever. To find out which multi-megapixel movie maker you want to clip onto your display, and to see how the SkypeHD-compatible offerings stack up against Logitech’s latest HD shooter, we gathered three cameras at a range of prices. Two will work with some particularly advanced TVs, while the third cam shuns Skype, offsetting that shortcoming with a middle-ground price and superior video quality. Which is your ticket to HD chat bliss, and how do they all compare to plain ‘ol VGA? Find out after the break. 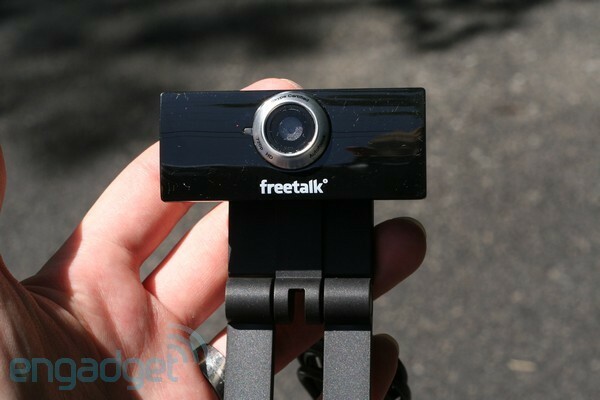 We’ll start at the low end, with the $60 Freetalk Everyman HD, also known as the Talk-7140. 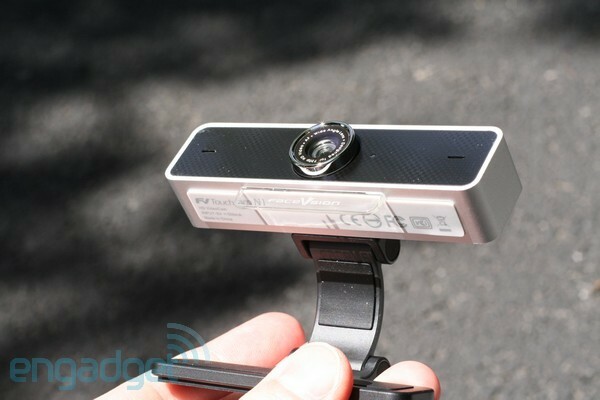 It brings SkypeHD compatibility to the table, meaning it features an onboard video encoder. This offers two big advantages: low CPU utilization if your machine is a bit of a clunker, and compatibility with non-computer devices (like those aforementioned TVs). The Everyman HD maxes out at 720p at 22fps through SkypeHD (the camera identified a maximum of 11fps through our recording software) and, compared to the competition, offers a relatively limited field of view. Video quality is a bit chunky and, while it’s not bad, it’s also not considerably better than your average integrated unit. In terms of escalating price, Logitech’s offer comes next, priced at $99. For that money you get a full 1080p’s worth of pixels, but as we found in our recent hands-on preview that many bytes seems rather overkill for most webcam-related uses. Indeed, Logitech’s own software maxes out at 720p when chatting online. And that brings us to something of a major point here: this camera does not have an onboard video encoder and so is not compatible with SkypeHD. This means if you’re worried about bothering your CPU too much, or exclusively do video chat on Skype, you won’t be able to take advantage of the extra pixels here. That said, CPU utilization wasn’t too major (about 30 to 40 percent on our 2.5GHz Core 2 Duo laptop) and, so long as you’re not using Logitech’s recording software (we used Sony Vegas) the resulting video quality is quite good. It’s a bit dark, but good, and with a wealth of manual controls here including aperture settings and focus, you can tweak it just how you like. It is the most sophisticated looking of the three, with a good bit of heft in its swiveling stand and an attractive mix of gloss and matte surfaces. It also offers stereo microphones that capture great sound. FaceVsion’s TouchCam N1 again brings us back down to 720p, but augments it with high-quality stereo mics that provide improved audio quality compared to your average integrated unit, and seemed about on-par with Logitech’s offering. A wider lens here than on the Everyman HD captures more of your surroundings, and the image here was the brightest of the three in our tricky testing situation, but was also somewhat grainy and grimy, not nearing the image quality of the Logitech. hame, because at $120 it is the most expensive model here. 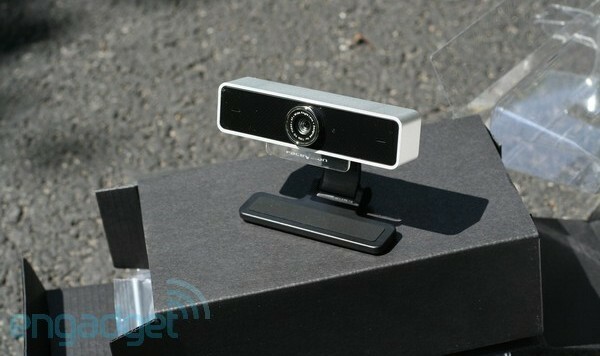 Of course, that extra cash does get you SkypeHD compatibility again, and all the benefits of an onboard video encoder. Its stand is not significantly different than the other two, but it is the most stable when standing free on a flat surface. It’s also the only one that has a miniUSB port on the back rather than a non-removable cable, which makes it easy to pack and, if your name is Edward Scissorhands, easy to replace. We won’t say too much here, as really everything you need to know is in the video above, which shows the same situation shot with all three cameras. We intentionally picked a tricky situation, a somewhat dimly-lit room with a window behind, to see which would fare the best. Also, we intentionally left each camera in automatic mode, though each allows modification of various exposure settings. The TouchCam N1 gave the brightest image, while the C910 offered the best overall quality, though it did suffer from some periodic focus hunting. The Everyman HD, meanwhile, was still the cheapest. Well, next-cheapest anyway compared to the integrated cam in the Lenovo T400s that we used as something of a benchmark. That camera is capable of higher resolutions, but we knocked it back to good ‘ol 640 x 480 to give you a taste of how these cameras compare to your average integrated webcam. The difference is noticeable, particularly when it came to handling the dimness of the room, but is it worth the extra cash? We’d also like to point out that both the Freetalk and the TouchCam N1 are rated at a maximum of 22fps when filming at 720p. However, when capturing through Sony Vegas both managed a maximum of 11fps. We don’t think this really had any impact on the resulting quality of the footage, but we’re passing that info along just the same. In terms of ultimate quality you have to give it to the C910, which didn’t provide the brightest image but was definitely the most clear. However, lack of compatibility with SkypeHD means that if you’re hoping to get your video chat on through your next-gen TV or integrated device Logitech’s cam simply isn’t an option. 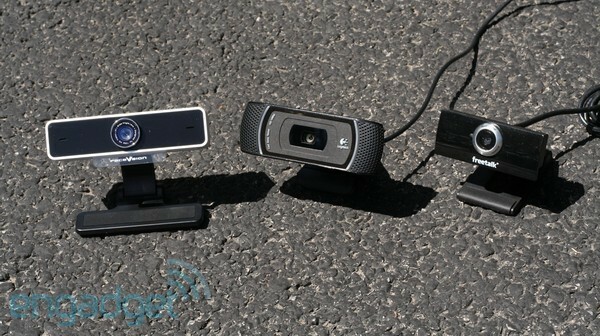 Nor can you do HD chat on Skype over your PC, but we’re fully expecting that Skype will start to allow webcams like this into the fold at some point down the road. So, between the two SkypeHD cams, is the N1 worth the 100 percent premium over the other? In terms of sheer video quality we’d have to say no, that the brighter image and wider field of view is let down by similarly murky overall quality. But, with no integrated microphone we’re not sure the Everyman HD necessarily fits into our lifestyle either. That said, the beauty of these things is you don’t have to take it from us. Just watch that video above, look at the prices, and decide for yourself which one of these you want to take online — if, that is, you want to work with any of them. Stampa l'articolo Questo articolo è stato pubblicato da Camillo Sirianni il 28 giugno 2010 alle 18:24, ed è archiviato come Gadget tecnologici. Puoi seguire i commenti a questo post attraverso RSS 2.0. Puoi pubblicare un commento o segnalare un trackback dal tuo sito. The[url=http://www.gurmanya.com]. [/url] judgement encompassed all aspects of urban planning, both in the draw up of Paris and in the natal districts: streets and boulevards, regulations imposed on facades of buildings, complete parks, sewers and bottled ditch-water works, metropolitan area facilities and community monuments. The planning was influenced next to individual factors, not the least of which was the elephantine apple’s information of roadway revolutions.